A cowboy-hat-wearing Mormon rancher who died during the arrests of his fellow Oregon occupiers on Tuesday night had vowed weeks ago never to be taken alive by authorities. LaVoy Finicum, one of the protesters' de facto spokesmen, died after shots were fired when police stopped the group on Highway 395 as they headed to a public meeting. Five of his cohorts were arrested at the scene, officials said. Oregon State Police said an investigation was being carried out into what it described as a "officer-involved shooting," following protocols used "when deadly physical force is used." The FBI and state police said they had conducted "enforcement action" along the highway at around 4:25 p.m. local time (7:25 p.m. ET). Authorities would not confirm Finicum's death but his daughter Challice Finch told NBC News that she had been notified by another protester. 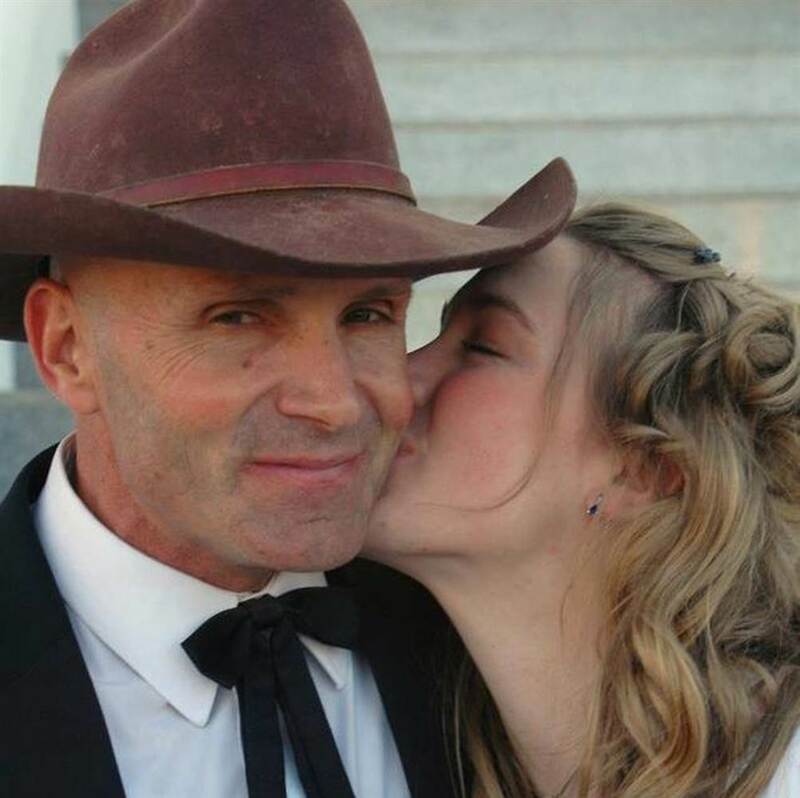 Finicum was a Mormon rancher from Arizona who had 11 children, 19 grandchildren and a wife of 23 years. During the occupation, the 54-year-old broke away from the rest of the group and set up a one-man camp on a chair outside the building, hunkered down under a sleeping bag, a tarpaulin, and clutching his rifle in the bitter January air. Finicum vowed three weeks ago that he would rather die than be taken into custody. "There are things more important than your life and freedom is one of them," he told MSNBC from his makeshift post. "I'm prepared to defend freedom." Finch, one of Finicum's 11 kids, told NBC News late Tuesday the protesters "were all committed to not firing on federal agents." The group seized Malheur National Wildlife Refuge on January 2 in the wake of a protest in the nearby town of Burns against the imprisonment of two ranchers convicted of setting fires on government land. They vowed to stay there until federally owned land was returned "back to the people." In the early days of the occupation, Finicum hinted that he was keen for a swift end to the dispute. "I need to get home," he said. "I got cows that are scattered and lost." Some of the protesters said that there had been negotiations with the FBI. Finicum said in an interview with The Oregonian newspaper a day before his death that "the tenor has changed, [law enforcement] have become more hardened." He added: "They're doing all the things that show they want to take some kinetic action against us, and we're saying, 'Why be so unfriendly?'" According to Finch, the group was traveling to the town of John Day, where some of them had been due to appear at a public meeting Tuesday night. Five people were arrested, one of whom was injured and later discharged from hospital and taken into custody, according to a joint statement by the FBI and state police. Two were arrested in a separate but related incident and one person turned themselves in later Tuesday, it added. All the suspects face federal felony charges of conspiracy to impede federal officers from discharging their official duties through the use of force, intimidation or threats, authorities said. It was unclear how many protesters remained in the federal wildlife refuge. Oregon Gov. Kate Brown asked for "patience as officials continue pursuit of a swift and peaceful resolution." Among the five arrested on Highway 395 were Ammon and Ryan Bundy, the 40 and 43-year-old brothers leading the occupation. The Bundys are sons of Nevada rancher Cliven Bundy, who was involved in a high-profile 2014 standoff with the government over grazing rights. The other three highway arrests were Brian Cavalier, 44, of Bunkerville, Nevada; Shawna Cox, 59, of Kanab, Utah; and Ryan Waylen Payne, 32, of Anaconda, Montana. Joseph Donald O'Shaughnessy, 45, of Cottonwood, Arizona, and Peter Santilli, 50, of Cincinnati, were arrested later in separate but related incidents, the FBI said. Later Tuesday night, another member of the group, Jon Eric Ritzheimer, 32, turned himself in at the Peoria, Arizona, Police Department, the FBI said.